Rose is a long time contributor to shortarmguy.com and a very nice lady. Yesterday Rose was named as Veteran of the Month by the the Illinois Department of Veterans’ Affairs. Congratulations Rose and thanks for everything you did to serve our country!! SPRINGFIELD – In conjunction with Women’s History Month, the Illinois Department of Veterans’ Affairs (IDVA) today honored decorated United States Air Force Veteran Rosemary Connolly as March 2011 Veteran of the Month at a ceremony in Springfield. The Illinois Veteran of the Month award is a distinction that is given to military Veterans who give back to their community and continue to serve other Veterans. IDVA Director Dan Grant presented the award to Connolly at American Legion Post 32 in Springfield. Connolly, a Milwaukee native and current information services specialist for the State of Illinois Department of Financial and Professional Regulation, served in the U.S. Air Force for 22 years, retiring as a Master Sergeant. She was awarded the Meritorious Service Medal, Joint Service Commendation Medal, Air Force Commendation Medal with one oak leaf cluster, and the Air Force Outstanding Unit Award with four oak leaf clusters. Connolly was deployed to Saudi Arabia during Operations Desert Shield and Desert Storm, for which she received the Air Force Expeditionary Medal. 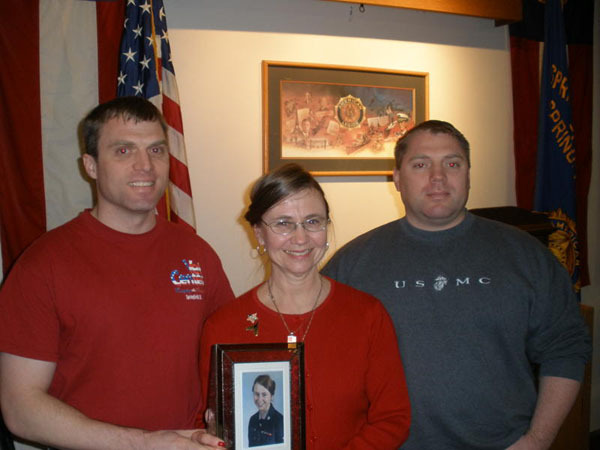 IDVA honored Connolly, 57, for extensive work on behalf of Illinois veterans. An avid motorcyclist, she is a member of the Illinois Patriot Guard, American Legion Post 32 Legion Riders, Mothers to Marines and an Honor Flight guardian. She also hosts the Wreaths Across America statehouse ceremony and is a life member Women in Military Service for America memorial, among many other affiliations.